I have prayed, pondered, and almost wept over the last several weeks while trying to make sense out of all of this. I have asked myself, which American do I prefer my son to live in? If I had to choose between a society where he is aware of who dislikes him because of the color of his skin and they are open and honest about their prejudices OR would I prefer he lived in a country where people overtly express their love for him, but covertly act in a way that does not support that notion? My answer…Neither! But if I had to choose, I would much rather know who hates me and have the ability to respond accordingly than to not know and suffer the effects of their hatred and discrimination. I would rather know than to be frustrated by an invisible wall of resistance, not understanding why I am not able to get beyond where I am. Honestly, the Neo-Nazi / Racist protesters in Charlottesville don’t scare me. I am more fearful of the Congressman who verbally detest what they did and stand for, but not willing to make policies that counter the systemic injustices that are taking place within our criminal justice system. I am more afraid of the police officer who pulls me over because he does not think I can afford or deserve to live in my neighborhood and points a gun at me because of his preconceived notions of me. I am more terrified of an Attorney General who believes Affirmative Action is an injustice to him because he fails to process or understand the need for the law, to begin with. I am more panic-stricken by a social construct that is built to limit the economic opportunities of an entire community of people but can make it appear as if it is their fault for not working hard enough. 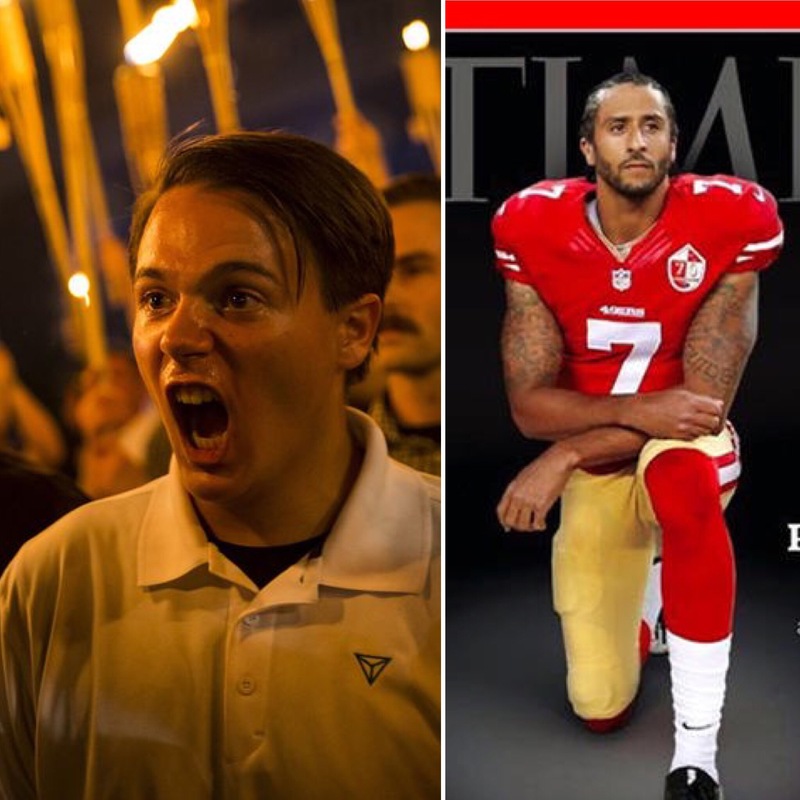 I am more frightened of people who did not know, realize, or acknowledge that racism still existed until seeing the torches and swastikas in Charlottesville. I could go on, but there is a group of people who look far less threatening, but possess an extraordinary amount of influence and power to impact my son’s life in ways that will affect generations to come. Elie Wiesel said, “the opposite of love is not hate, it is indifference.” To say you care for someone and detest actions that hurt or offend the ones you say you care about without the willingness to make sacrifices for them, will cause your genuineness to be called into question. Colin Kaepernick simply chose not to be indifferent. It is evident why he protested is true and still taking place today. It’s ok to question his motives until he explains why he took a knee in the first place. To continue to have a problem with his non-violent, silent protest after he explains why, only exacerbates his reasons for kneeling, to begin with. Kaepernick is a microcosm of what I fear. He represents a community of people doing a right thing for the right reason, however, because someone has POWER and INFLUENCE, they oppress them, remove the economic opportunity, and make it appear to be ALL their fault. Suppose that was your kid with a conviction? Do you believe he should lose his livelihood and ability to take care of his family because he decided to have a voice? Would you support your son or ask him to compromise? In closing, Steve Bannon called the protestors of Charlottesville a “collection of clowns.” At first glance, it appears to be the “pot calling the kettle black.” However, after I mused over it a bit more, I believe it justified my argument above. Bannon is the type that I fear. He is someone with influence, in a position of power, who can oppress the opportunities of a set of people. He can call the Neo-Nazi’s in Charlottesville “clowns” because he views them as being beneath him and only masquerading with no “real” power or influence. If this type can cause us to focus on them (the clowns), then those with influence and power can continue to “Make America Great Again” without any opposition. We must not allow tweets from 45 and social media post to distract us from what they are enacting or the indifference of those who were elected to follow through on what they say they stand for. It is not enough to make public statements that denounce bigotry, then fail to pass legislation that eradicates the same; or worse, write laws that perpetuate the injustices. Call your Congressman or Congresswomen, today, and tell them that they can no longer be indifferent. Cause them to act on what they say they believe. Secret hate is far worse than public love. Make the call today!